Where can I buy a real human skull? 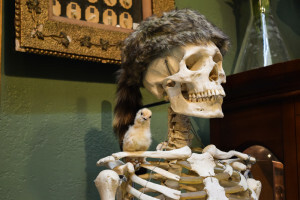 Every year many artists, oddity collectors, and miscellaneous interesting characters take to the internet in the hopes of acquiring a real human skull. Unfortunately, actual human skulls are not easy to find and tend to be exorbitantly priced. If you’d like a real human skull but don’t have $1,500 dollars to spend on what is essentially an amazing coffee-table piece, read on. Below is a hopefully-complete list of all the places in North America where genuine human skulls are for sale and the prices/quality at each vendor. If you don’t want your human skull purchase recorded on your credit-card bill, or if your spouse/roommate likes to open your mail, you might want to purchase your skull in person. There are a small number of retail locations where you can buy a real human skull over-the-counter. If you’re looking to buy online, click here for online retailers. This flea market is a recurring two-day event originally organized by the Morbid Anatomy Museum (morbidanatomymuseum.org). The Morbid Anatomy Museum closed in December of 2016, but the flea market lives on. It has been rebranded the “Oddities Flea Market” and seems to occur a few times a year. The flea market has grown to nearly seventy vendors, several of whom sell human bones. It is currently being held in the Brooklyn Baazar at 150 Greenpoint Avenue. The next event will be held December 2-3 of 2017 and will be holiday-themed. 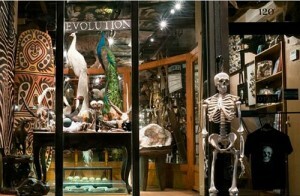 The Evolution Store (theevolutionstore.com) sold real human skulls until recently. There is still a “natural human bone” category on their website, but it does not contain any products. It is unclear whether the evolution store stopped selling human bones, is temporarily out of stock, or has human skulls in stock but hasn’t posted them on the website. People on the west coast have what is probably the best brick-and-mortar option. The Bone Room (boneroom.com) features a wide selection of real human skulls, including child and fetal skulls, vintage skulls prepared for medical education, and skulls exhibiting various pathologies. Unfortunately, their retail location on Solano Ave. in Berkeley, California closed in the summer of 2016. The shop moved to a showroom in Los Alamitos, and visits to the showroom are by appointment only. Contact owner Diana Mansfield at boneroom@gmail.com or (510) 526-5252 to make an appointment. Prices range from $850 for a damaged skull to $3000 for some specialty skulls. Most skulls are priced in the $1,000-$3,000 range. The Bone Room also sells complete real human skeletons for several thousand dollars. Canadians who don’t want to experience the awkwardness of crossing the border with a human skull have a brick-and-mortar option in Toronto. The Skull Store (skullstore.ca) has a small selection of real human skulls. They carry some really cool vintage indigenous skull art, although it’s not cheap. There is a carved 19th Century Tibetan prayer skull for $7,000, and a traditional Dayak skull from Borneo for $1,950. 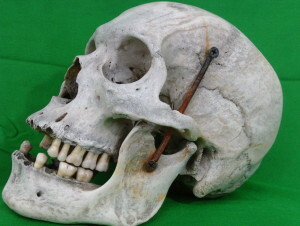 On the low end, there is a skull with no jaw and the face broken off for $400. Osta International (osta.ca) is the leading online human bone retailer in Canada. Osta appears to be oriented towards the professional and institutional market for human bones. There is a wide selection of human bone specimens. You can buy any product other than the human skulls through an online shopping cart, including individual bones that form sections of the skull. 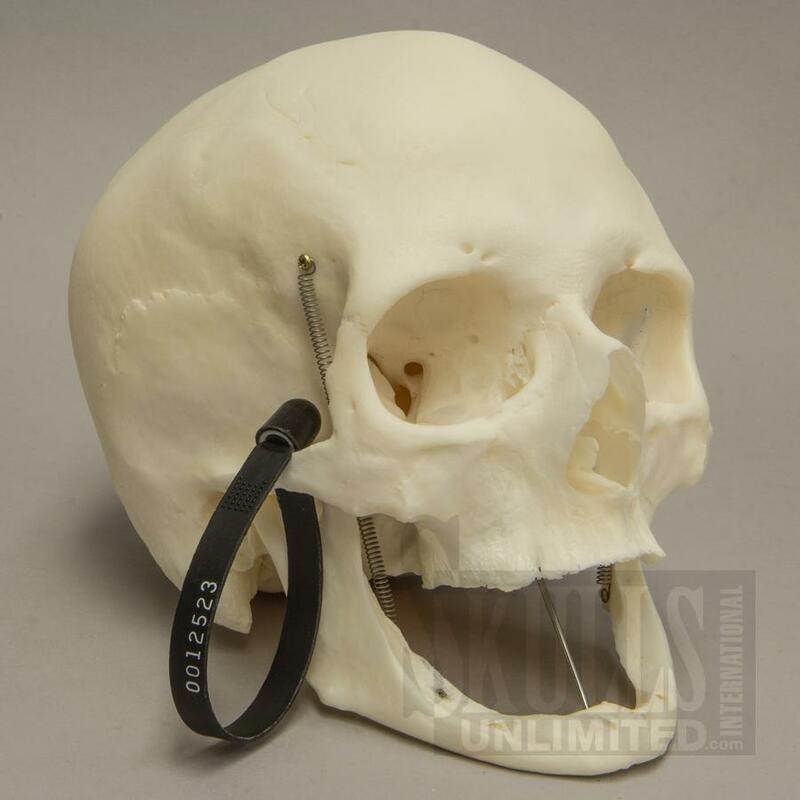 Unlike everything else on the site, the prices for the real human skulls are not listed and you are required to contact Osta International to inquire about them. The product photos leave much to be desired. They’re black and white, don’t show much detail, and look like they were taken in 1970. 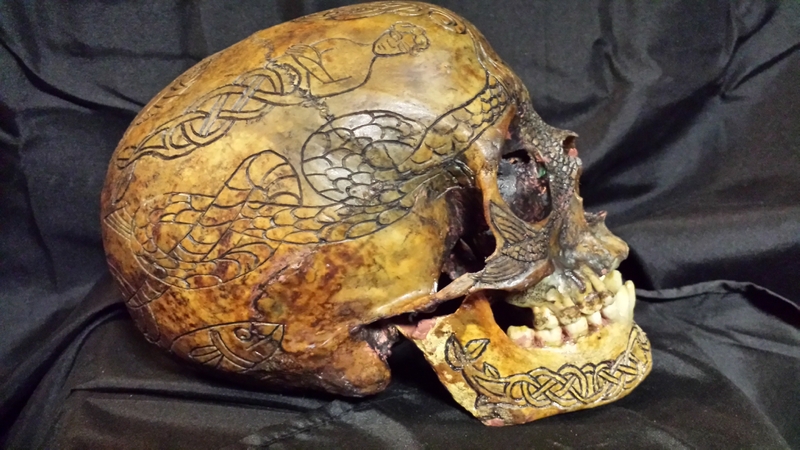 Osteologywarehouse.com is a US-based online retailer featuring a small selection of real human skulls, ranging in price from $495 for a real human skull without a jaw to $845 for a bizarre dwarf skull. Most of the real human skulls are priced in the high three-figures. There are also a couple skulls which are sliced in half vertically and open on a hinge attached to the back of the head. You can see the sinus cavities, a cross-section of the nose, and the outlines of the veins and arteries that connect to the brain. 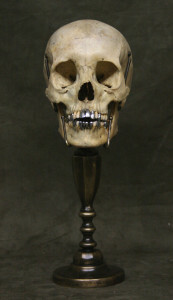 Museumoddities.com is run by Brian Kubasco, a US-based artist who creates modern pieces that often incorporate real human skulls. 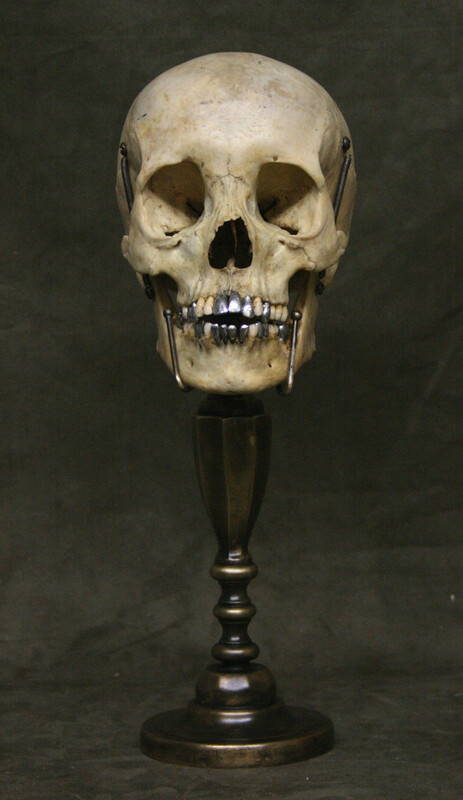 He has a distinctive, morbid “steampunk” style and focuses mostly on dental phantoms, which are creepy-looking models used for dental education. 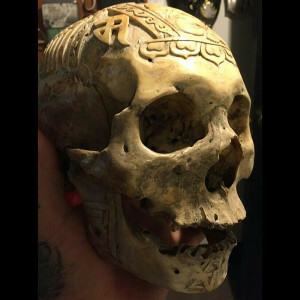 He has both real and realistic replica human skulls, so be careful to check which you are buying. The real skulls are placed on decorative stands and have a mixture of real teeth and metal teeth that Brian sculpts and inserts. His pieces made from real skulls go for about $950-$1400. As of 7/29/2016, there were no pieces incorporating real human skulls listed for sale at Museum Oddities. It is unclear when or if more will become available. Skullsunlimited.com has a broad selection of genuine human skulls. Half of a skull goes for $650 while an undamaged adult male skull with a full set of teeth runs $1850. They also carry human skeletons and a broad selection of animal skulls. About half the skulls are labeled as “research quality” and according to the website can only be purchased by certain institutions and professionals. The other half are available for sale to the general public. The skulls available to the public are generally the most expensive, ranging in price from $1650 to $1999. Zane Wylie (realhumanskull.com) carves beautiful, detailed works of art out of real human skulls. Unfortunately, they’re not cheap: an original Zane Wylie piece will set you back at least $3,500 dollars. Themes range from “Celtic Warrior” to “Mermaid Queen.” If an original piece is out of reach, high-quality replicas are available for a more reasonable $249.95. UPDATE: As of 7/8/2016, eBay appears to have banned real human skulls and skeletons from the site. Listings of all human bones except for teeth are being removed by site administrators. It seems that you can no longer buy a real human skull on eBay. You can buy a real human skull on Amazon, but it is not recommended. There are usually only two real human skulls available at a time, one each from Skulls Unlimited and Osteology Warehouse. They both charge higher prices on Amazon than you would pay on their website. Also: Is it legal to buy, sell, or possess a real human skull in the United States?